Wassily Kandinsky (December 4 or 16, 1866 - December 13, 1944) — was a Russian painter and art theorist and one of the leading figures in Blaue Reiter. One of the most important 20th-century artists, he is credited with painting the first modern abstract art works. Kandinsky, June 1930: 'Surfaces and Lines', oil-painting on board; location unknown - quote of Barnett Newman, 1965: 'I think that some abstractions - for example Kandinsky's - are really nature paintings. The triangles and the spheres or circles could be bottles. They could be trees, or buildings.. Frankly, I think there is something wrong with Jawlensky's dots [in his paintings, then]. Anybody can pick up that style if they want to. At an unknown hour, from a source that is still sealed to us, but inexorable, the Work comes into the world. Cold calculations, splashes leaping up without plan, mathematically accurate construction (laid bare or concealed) silent, screaming drawing, scrupulous finish, colour in fanfares or played pianissimo on the strings, large, serene, cradling, fragmented planes. Isn’t that a Form? Aren't those the means? Suffering, seeking, tormented souls with a deep fissure, caused by the collision of the spiritual with the material.. .Shame on him who turns his soul's ear away from the mouth of art. A human being speaks to human beings about the superhuman – the language of art. The impressions we receive, which often appear merely chaotic, consist of three elements; the impression of the color of the object, its form, and of its combined color and form, i.e., of the object itself. At this point the individuality of the artist comes to the front and disposes, as he wills, these three elements. It is clear, therefore, that the choice of object (i.e., of one of the elements in the harmony of form) must be decided only by a corresponding vibration in the human soul..
Mystery, speaking through mysteries. Insn't that meaning? Isn't that the conscious or unconsciousnes purpose of the compulsive urge to create? Opposites and contradictions, that is our harmony. German original: Gegensätze und Widerspruche, dass ist unsere Harmonie. [ Schoenberg's ] music leads us into a realm where musical experience is a matter not of the ear but of the soul alone, and at this point the music of the future begins. In your [ composer Schönberg's ] works, you have realized what I, albeit in uncertain form, have so greatly longed for in music. The independent progress through their own destinies, the independent life of the individual voices in your compositions, is exactly what I am trying to find in my painting. At the moment there is a great tendency in painting to discover the 'new' harmony by constructive means whereby the rhythmic is built on an almost geometric form.. .I am certain that our own modern harmony is not to be found in the 'geometric' way, but rather in the anti-geometric, anti-logical way. And this way is that of 'dissonance in art', in painting, therefore, just as much as in music. And 'today's' dissonance in painting and music is merely the consonance of 'tomorrow'. ..the works of Mozart. They create a welcome pause amidst the storms of our inner life, a vision of consolation and hope, but we hear them like sounds of another, vanished and essential unfamiliar age. Clashing discords, loss of equilibrium..
An artist who sees that the imitation of natural appearances, however artistic, is not for him – the kind of creative artist who wants to, and has to express his own inner world – sees with envy how naturally and easily such goals can be attained in music, the least material of the arts today. Understandably, he may turn toward it and try to find the same means in his own art. Hence the current search for rhythm in painting, for mathematical abstract construction.. ..the way colors are set in motion, etc. [Their] things [works of Die Brücke-artists] must be exhibited. But I think it is incorrect to immortalize them in the document [Almanac] of our modern art (and, this is what our book ought to be) or as a more or less decisive, leading factor. At any rate I am against large reproductions [of Die Brücke paintings in The Blaue Reiter Almanac]. If until now colour and form were used as inner agents, it was mainly done subconsciously. The subordination of composition to geometrical form is no new idea (cf. the art of the Persians). Construction on a purely spiritual basis is a slow business, and at first seemingly blind and unmethodical. The artist must train not only his eye but also his soul, so that it can weigh colours in its own scale and thus become a determinant in artistic creation. If we begin at once to break the bonds that bind us to nature and to devote ourselves purely to combination of pure colour and independent form, we shall produce works that are mere geometric decoration, resembling something like a necktie or a carpet. Beauty of form and colour is no sufficient aim by itself, despite the assertions of pure aesthetes or even of naturalists obsessed with the idea of "beauty". It is because our painting is still at an elementary stage that we are so little able to be moved by wholly autonomous colour and form composition. The nerve vibrations are there (as we feel when confronted by applied art), but they get no farther than the nerves because the corresponding vibrations of the spirit which they call forth are weak. When we remember however, that spiritual experience is quickening, that positive science, the firmest basis of human thought is tottering, that dissolution of matter is imminent, we have reason to hope that the hour of pure composition is not far away. The first stage has arrived. The more freely abstract the form becomes, the purer, and also the more primitive it sounds. Therefore, in a composition in which corporeal elements are more or less superfluous, they can be more or less omitted and replaced by purely abstract forms, or by corporeal forms that have been completely abstracted.. .Here we are confronted by the question: Must we not then renounce the object altogether, throw it to the winds and instead lay bare the purely abstract? This is a question that naturally arises, the answer to which is at once indicated by an analysis of the concordance of the two elements of form (the objective and the abstract). Just as every word spoken (tree, sky, man) awakens an inner vibration, so too does every pictorially represented object. To deprive oneself of the possibility of this calling up vibrations would be to narrow one's arsenal of expressive means. At least, that is how it is today. But apart from today's answer, the above question receives the eternal answer to every question in art that begins with 'must.' There is no 'must' in art, which is forever free. The disharmoniousness (one might say, the negative rhythm) of the individual forms was that which primarily drew me, attracted me, during the period to which this watercolor belongs. The so-called rhythmic always comes on its own because in general the person himself is rhythmically built. Thus at least on the surface, the rhythmic is innate in people. Children, 'primitive' peoples, and laymen draw rhythmically.. In that period my soul was especially enchanted by the not-fitting-together of drawn and painterly form. Line serves the plane in that the former bounds the latter. And it makes my heart race in those cases when the independent plane springs over the confining line: line and plane are not in tune! It was this that produced a strong inner emotion in me, the inner 'ah! In this painting ['Moscow'], I was in fact in quest for a certain hour, which was and which remains always the most beautiful hour of the day in Moscow. The sun is already low and has reached its highest force, which it has searched all the day, to which it has aspired all the day.. .The sun dissolves all Moscow in a spot, which as a frenzied tuba makes entered into vibration all the inner being, the whole soul.. .Rendering this hour seemed the biggest, the most impossible of the happiness for an artist. These impressions renewed every sunny day. They brought me a joy which shattered me until the bottom of the soul, and which reached until ecstasy. We can only assert here, with especial satisfaction, that Gabriele Münters talent, robust, rooted in an inward strength and sensitivity, in fact genuinely German, should in no circumstances be assessed as masculin, or as 'quasi-masculine'. This talent – and we emphasize it, once more, with great satisfaction – can only be described as exclusively and purely feminine.. .Gabriele Münter doesn't paint feminine subjects, she does not work with feminine materials, and does not permit herself any feminine coquetry. Their are neither raptures, nor agreeable exterior elegance, nor appealing weaknesses to be found here. Nor, on the other hand, are there any masculine charms [in Gabriele Münter's work] either: no 'sinewy brushwork', no heaps of paint, 'hurled on to the canvas'. The pictures are painted throughout with a delicately and correctly sensed measure of external strength, with not a trace of feminine or masculine coquetry in the 'making'. We could almost say that they are painted modestly; i. e. that they were inspired, not by a desire for outward display, but by a purely inward compulsion. Of the 16 years that I have been living in Germany, I have given myself entirely to the German art world. How am I now suddenly supposed to feel myself a foreigner? First I will make different color tests: I will study the dark – deep blue, deep violet, deep dirty green, etc. Often I see the colors before my eyes. Sometimes I imitate with my lips the deep sounds of the trumpet – then I see various deep mixtures which the word is uncapable od conceiving and which the palette can only feebly reproduce. Every work of art is the child of its age and, in many cases, the mother of our emotions. It follows that each period of culture produces an art of its own which can never be repeated. Efforts to revive the art-principles of the past will at best produce an art that is still-born. It is impossible for us to live and feel, as did the ancient Greeks. In the same way those who strive to follow the Greek methods in sculpture achieve only a similarity of form, the work remaining soulless for all time. Such imitation is mere aping. Externally the monkey completely resembles a human being; he will sit holding a book in front of his nose, and turn over the pages with a thoughtful aspect, but his actions have for him no real meaning. There is, however, in art another kind of external similarity which is founded on a fundamental truth. When there is a similarity of inner tendency in the whole moral and spiritual atmosphere, a similarity of ideals, at first closely pursued but later lost to sight, a similarity in the inner feeling of any one period to that of another, the logical result will be a revival of the external forms which served to express those inner feelings in an earlier age. Generally speaking, colour is a power which directly influences the soul. Colour is the keyboard, the eyes are the hammer, the soul is the strings.The artist is the hand that plays, touching one key or another, to cause vibrations in the soul. The more abstract is form, the more clear and direct is its appeal. In any composition the material side may be more or less omitted in proportion as the forms used are more or less material, and for them substituted pure abstractions, or largely dematerialized objects. The more an artist uses these abstracted forms, the deeper and more confidently will he advance into the kingdom of the abstract. And after him will follow the gazer at his pictures, who also will have gradually acquired a greater familiarity with the language of that kingdom. Must we then abandon utterly all material objects and paint solely in abstractions? The problem of harmonizing the appeal of the material and the non-material shows us the answer to this question. As every word spoken rouses an inner vibration, so likewise does every object represented. To deprive oneself of this possibility is to limit one's powers of expression. That is at any rate the case at present. But besides this answer to the question, there is another, and one which art can always employ to any question beginning with "must": There is no "must" in art, because art is free. It is never literally true that any form is meaningless and "says nothing." Every form in the world says something. But its message often fails to reach us, and even if it does, full understanding is often withheld from us.] and, properly speaking, FORM IS THE OUTWARD EXPRESSION OF THIS INNER MEANING. The work of art is born of the artist in a mysterious and secret way. From him it gains life and being. Nor is its existence casual and inconsequent, but it has a definite and purposeful strength, alike in its material and spiritual life. All means are sacred when they are dictated by inner necessity. All means are reprehensible when they do not spring from the fountain of inner necessity... The artist must be blind to 'recognized' and 'unrecognized' form, deaf to the teachings and desires of his time. His open eyes must be directed to his inner life and his ears must be constantly attuned to the voice of inner necessity. At the appointed time, necessities become ripe. That is the time when the Creative Spirit (which one can also designate as the Abstract Spirit) finds an avenue to the soul, later to other souls, and causes a yearning, an inner urge. Since the form is only an expression of the content and the content is different with different artists, it is then clear that there can be many different forms at the same time which are equally good. Necessity creates the form. Fish which live at great depths have no eyes. The elephant has a trunk. The chameleon changes its color, and so forth. I would love to paint a large landscape of Moscow — taking elements from everywhere and combining them into a single picture—weak and strong parts, mixing everything together in the same way as the world is mixed of different elements. It must be like an orchestra.. .Suddenly I felt that my old dream was closer to coming true. You know that I dreamed of painting a big picture expressing joy, the happiness of life and the universe. Suddenly I feel the harmony of colors and forms that come from this world of joy. I am working again on my painting 'Moscow' ['Moscow I' ('Mockba I'), 1916]. It is slowly taking shape in my imagination. And what was in the realm of wishing is now assuming real forms. What I have been lacking with this idea was depth and richness of sound, very earnest, complex, and easy at the same time. Kandinsky, Wassily – painter, printmaker and author – the first painter to base painting on purely pictorial means of expression and abandon objects in his pictures. The first colours which made a strong impression on me were light juice green, white, crimson red, black and yellow ocher. These memories go back to the third year of my life. I saw these colours on various objects [houses and roofs, in Russia] which are not as clear in my mind as the colours themselves. ..emotion that I experienced on first seeing the fresh paint come out of the tube.. ..the impression of colours strewn over the palette: of colours – alive, waiting, as yet unseen and hidden in their little tubes.. I thought that the painter had no right to paint so unclearly.. ..(but) the first faint doubt as to the importance of an 'object' as the necessary element in painting. If the artist has outer and inner eyes for nature, nature rewards him by giving him inspiration. ..the long Russian word for creation: 'proisvedenie' - so different from its shorter counterparts in English, French and German - expresses for me the whole history and process of creation, lengthy, mysterious, infinitely complex and foreshadowed by divine predestination. The destruction of the atom [the split of it, in modern physics] seemed to me to be the same as the destruction of the world.. ..science to me appeared to be dead: its most important basis was only a lunacy, a mistake perpetrated by learned men.. ..who blindly mistook one object for another. [Art is] ..the mysterious expression of the mysterious..
At that time [c. 1904 – 1905] I tried, by means of lines and by distribution of mottled points of colours [in his tempera painting on paper: 'Russian Beauty in a Landscape', 1905] to express the musical spirit of Russia. Other pictures of that period reflected the contradictions and later the eccentricities of Russia. The horse carries the rider with power and speed. But the rider controls the horse. Talent carries the artist to great heights with power and speed. But the artist directs his talent. That is the element of 'consciousness', of 'calculation' in the work – or whatever else one chooses to call it. ..I let myself go.. [in Kandinsky's Murnau-period when he was painting in open air; c. 1908 – 1914] I thought little of the houses and trees, but applied colour stripes and spots to the canvas with the knife and made them sing out as strongly as I could. Within me sounded the memory of early evening in Moscow, before my eyes was the strong, colour-saturated scale of the Munich light and atmosphere, which thundered deeply in the shadows. In many ways art is similar to religion. Its development consists not in new discoveries which invalidate the old truths (as is obviously the case in science). Its development consists in sudden illuminations, similar to lightning, in explosions, which burst in the sky like fireworks.. ..this illumination shows with blinding light new perspectives, new truths, which are basically nothing but the organic development, the further organic growth of the earlier wisdom.. .Was the New Testament possible without the Old? Could our time, that of the threshold of the 'third' revelation, be thinkable without the second? Painting is a thundering conflict of different worlds, which in and out of the battle with one another are intended to create the new world, which is called the world of art. Each work arises technically in a way similar to that in which the cosmos arose – through catastrophes, which from the chaotic roaring of the instruments finally create a symphony, the music of the spheres. The creation of the work is the creation of worlds. You mention the circle and I agree with your definition.. ..why does the circle fascinates me? It is (1) the most modern form, but asserts itself unconditionally, (2) a precise but inexhaustible variable, (3) simultaneously stable and unstable, (4) simultaneously loud and soft, (5) a single tension that caries countless tensions within it. The circle is the synthesis of the greatest oppositions. It combines the concentric and the eccentric in a single form, and in balance. Of the three primary forms (triangle, square, circle), it points most clearly to the fourth dimension. We [ Franz Marc & Kandinsky] thought up the name [ Der Blaue Reiter (Blue Rider)] while sitting at a cafe table.. .Both of us were fond of blue things, [Franz] Marc of blue horses, and I of blue riders. So the title suggested itself. Content is nothing but the sum of organized tensions. From this point of view one can discover the basic identity of the rules of composition in all arts – always accepting that the arts can only represent their object materially by means of organised reactions.. ..already today one can safely assume that the roots of laws of composition are the same for art as they are for nature. My wish [c. 1911].. ..of compiling a book (a kind of Almanac) in which all the contributions should be written by artists. I dreamt primarily of painters and musicians. The ruinous separation of the arts from each other, and of 'Art' from folk-art and from children's art, the distinction between 'Art' and 'Ethnography' [folk-art].. ..the solid walls erected between phenomena that in my eyes were so closely related, even identical: in a word, the potentialities for synthesis left me no peace. It may well seem strange today  that for a long time I could not find any co-workers or any means to promote this idea..
Every phenomenon can be experienced in two ways. These two ways are not arbitrary, but are bound up with the phenomenon – developing out of its nature and characteristics : Externally – or – inwardly. The geometric point is an invisible thing. Therefore, it must be defined as an incorporeal thing. Considered in terms of substance, it equals zero.. .Thus we look upon the geometric point as the ultimate and most singular union of silence and speech. The geometric point has, therefore, been given its material form, in the first instance, in writing. It belongs to language and signifies silence. The geometric line is an invisible thing. It is the track made by the moving point; that is, its product. It is created by movement – specifically through the destruction of the intense self-contained repose of the point. Here, the leap out of the static to the dynamic occurs. […] The forces coming from without which transform the point into a line, can be very diverse. The variation in lines depends upon the number of these forces and upon their combinations. Well, we will indeed see how things develop and what will become of our art! In any case, artists should remain apolitical and only think of their work and dedicate all their energies to this work. We do not want to leave Germany forever. Something I would not be able to manage at all, since my roots sit too deep in German soil. Approaching it in one way, I see no essential difference between a line one calls 'abstract' and a 'fish'. But rather an essential likeness. This isolated line and the isolated fish alike are living beings with forces peculiar to them, though latent. They are forces of expression for these beings and of expression on human beings, because each has an impressive 'look' which manifests itself by its expression. But the voice of these latent forces is faint and limited. It is the environment of the line and the fish that brings about a miracle: the latent forces awaken, the expression becomes radiant.. .The environment is the composition. The composition is the organized sum of the interior functions (expressions) of every part of the work. But let us not speak anymore of books and theories on paper. Now then, did you see my exhibition? As you may remember, 1 gathered in 'Cahiers d'Art' ten very recent paintings, twenty-five gouaches and watercolors, also recent, and twenty-eight drawings that span the period from 1910-1934. In the majority of the compositions on canvas I used a sand technique more or less consistently.. ..but I usually don't distinguish between traditional oil painting, gouache, tempera and watercolor, and I even simultaneously use the various techniques in the same work. What is essential for me is to be able to clearly convey what I want, to recount my dream. / consider both technique and form to be mere instruments of expression, and my stories, furthermore, are not narrative or historical in character, but purely pictorial. An empty canvas is a living wonder - far lovelier than certain pictures. I have just finished one painting and am already at work on the preliminary drawings for the next one. I must do something in order to get rid of such habits or I won't manage to find time for any vacation. I have had this new painting in my mind since January, and must get it down on canvas. Each spiritual age expresses its special character in a form which corresponds exactly to its character. Each age in this way characterizes its true 'physiognomy', full of expression and strength. Thus in all spiritual areas 'yesterday' is transformed into 'today'. But apart from this, art possesses a further quality which it alone possesses: that quality which enables one to divine the 'tomorrow' today – a strength which is both creative and prophetic. Paris [1933 - 1944] with its wonderful (intense soft) light had relaxed my palette — there were other colors, other entirely new forms, and some that I had used years earlier. Naturally I did all this unconsciously. Up till then [c. 1895] I had known nothing but realist art, in effect only the Russians.. .And suddenly for the first time a saw a picture. The catalog told me it was a haystack [of Claude Monet; I couldn't tell it from looking. Not able to tell it upset me. I also considered that the artist had no right to paint so indistinctly. I had the dull sensation that the picture's subject was missing. And was amazed and confused to realize that the picture did not merely fascinate but impressed itself indelibly on my memory and constantly floated before my eyes, quite unexpectedly, completely in every detail. I did not understand any of this.. .What was quite plain to me, however, was that the palette had a strength that I heave never before suspected, far beyond anything that I had ever dreamt.. Houses and trees [in and around Murnau] made hardly any impression on my thoughts. I used the palette knife to spread lines and splashes of paint on the canvas, and made them sing as loud as I could. That fateful hour in Moscow [when he saw a colorful Haystack painting of Monet for the first time in his life] rang in my ears, my eyes were filled with the strong saturated colours of the light and air of Munich, and the deep thunder of its shadows. [looking back] I was unable to invent forms, and the sights of such forms always disgusts me. All the forms I ever used came of their own accord, they presented themselves to me already shaped, all I had to do was coy them, or else they took shape while I worked, often surprising me.. .I have trained myself not simply to let myself go, but to put reins on the power that works within me, and to guide it. Our sketchbooks and studies – as well as the paintings and photos, convey the detail of our Tunisian impressions [in 1904]. At times we got along well – at times not at all – we took walks in the city and also in the Belvedere park – it was never boring with my beloved, but we didn’t made contact with any other people; he never wanted it. In your works, I sense primeval, bygone things wedded with mystical vibrations of spiritual possibilities for the future. Can you imagine a music in which tonality (that is, the adherence to any key) is completely suspended? I was constantly reminded of Kandinsky's large composition which also permits no trace of tonality.. ..and also of Kandinsky's 'jumping spots' in hearing this music [of Schönberg ], which allows each tone sounded to stand on its own (a kind of white canvas between the spots of color). Schönberg proceeds from the principle that the concepts of consonance and dissonance do not exist at all. A so-called dissonance is only a mere remote consonance – an idea which now occupies me constantly while painting.. I have just read your book ['On the Spiritual in Art'] from cover to cover, and I will read it once more. I find it pleasing to an extraordinary degree, because we agree on nearly all of the main issues..
Kandinsky's teaching: scientifically rigorous examination of colour and form. Example: seek the corresponding elementary colour for the three forms (triangle, square and circle). It was decided that they are yellow for the triangle, blue for the circle and red for the square; so to say, once and for all. Kandinsky understood 'Form' as a form, like an object in the real world; and an object, he said, was a narrative—and so, of course, he disapproved of it. He wanted his 'music without words'. He wanted to be 'simple as a child.' He intended, with his 'inner-self,' to rid himself of 'philosophical barricades' (he sat down and wrote something about all this). But in turn his own writing has become a philosophical barricade, even if it is a barricade full of holes. It offers a kind of Middle-European idea of Buddhism or, anyhow, something too theosophic for me. It was this apparent paradox, by which the so-called Abstract Expressionists.. ..are really far more sympathetic to wards Mondrian than towards Kandinsky. The Mondrian thing seems paradoxical only in relation to the Mondrian that people interpreted in the [nineteen-]thirties as a rather cold and static artist. Maybe it is only more recently that we have realized about the blinking that takes place at the intersection of the lines, of shuttling back and forth and so on, that Mondrian becomes in some ways a more dynamic artist than Kandinsky. ..[quote of Newman, on making his work 'Onement', in 1948]..from then on I had to give up any relation to nature.. .That doesn't mean that I think my things are mathematical or removed from life. By 'nature' I mean something very specific. I think that some abstractions - for example Kandinsky's - are really nature paintings. The triangles and the spheres or circles could be bottles. They could be trees, or buildings. I think that in 'Euclydean Abyss' and 'Onement' I removed myself from nature. But I did not remove myself from life. Total abstraction was something intellectual to me. I didn't feel it.. ..I would go to the old Guggenheim [museum] to look at Kandinsky. I liked the early abstractions [in his Murneau period] but the later ones I didn't like at all. The students' relationship to Kandinsky was very respectful [at the Bauhaus.. .What he said was always insightful and more or less documented. In the case of Paul Klee, in contrast, everything was always up in the air. You could make what you wanted of it. 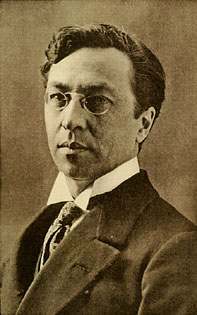 I met him Kandinsky shortly after my return to Germany from the United Sates.. .A year later, in 1901, I decided to move to Munich, but still found very little encouragement as an artist. German painters refused to believe that a woman could have real talent, and I was even denied access, as a student, to the Munich Academy.. .It is significant that the first Munich artist who took the trouble to encourage me was Kandinsky, himself no German but a recent arrival from Russia. As a student of Franz von Stück he Kandinsky still continued for a while to paint quite naturalistically. He admitted to me that he had always loved color, even as a child, far more than subject matter. Form and color were his main interests. To me he often remarked that 'objects disturb me'. But he could paint portraits, too. He [Kandinsky] had always expressed a great interest in abstraction when we visited Tunisia together in 1904. The Moslem interdiction of representational painting seemed to stir his imagination and that was when I first heard him say that objects disturbed him. Between 1907 and 1910 [the period in which Kandinsky painted his first abstract compositions], he began to rely increasingly on his own theories of art, which many of his friends could understand only with great difficulty. They [Kandinsky, Jawlensky and Paul Klee ] were constantly arguing about art and each of them, at first, had his own ideas and his own style. Jawlensky was far less intellectual than Kandinsky or Klee and was often frankly puzzled by their theories. As far as I am concerned, I learned this technique [the use of flat areas, painted in bright color - sometimes in contrasting juxtaposition, sometimes like pieces of colored glass in heavy dark outlines] from Kandinsky and, at the same time, from the glass paintings of the Bavarian peasants of the Murneau area, who had painted for centuries in this style. I have now forgotten who was responsible for the original idea (the publication of the Almanac 'Der Blaue Reiter', perhaps because I have never been particularly interested in theory.. .The Neue Künstlerverein [in Münich] didn't approve of Kandinsky's ideas in 1911 and rejected his 'Composition No. 5.' as too big for their show. So Kandinsky withdrew from the association, and Franz Marc, Kubín, Le Fauconnier and I followed this lead. It was then that Kandinsky began to write the book that became 'Der Blaue Reiter'. Whenever Kubín came to Munich from his nearby country retreat, they [Kandinsky and Kubin] spent many hours together, and I wish I had been able to take down in shorthand some of their conversations. Their ideas about art and life were so different.. .Kandinsky was an optimist; he had been interested, at first, in fairy tales and legends and chivalrous themes of the past, but he then became increasingly interested, after 1908, in formulating what he called the art of the future rather than indulging in romantic visions of the past. Kubin, on the other hand was a pessimist, always haunted by the past and suspicious of the future. This basic difference in their temperaments made their discussions all the more fruitful, and their friendship was the more intense. I don't think that Kandinsky was ever really a communist. 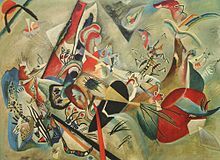 He just happened to be in Russia [Kandinsky went to Russia in 1914, because of the outbreak of the First World War, ànd his Russsian nationality] and to become involved in some revolutionary artistic activities because of his reputation as a revolutionary in the arts. In any case, he left Russia as soon as an opportunity arose. But we had parted, by that time, and I prefer not to express any opinion on Kandinsky's later ideas and beliefs, with which I was never familiar. Well, when we [Kandinsky and Gabriele Münter ] first met, Munich was still very much a center of plain-air painting [painting in open air], and Kandinsky himself was a plain-air painter too, to some extent. We used to go out sketching and painting together in the countryside [around Murnau], and he painted a picture of me sketching, and I also did one of him [on board in oil]. That was a long time ago in 1903. It was only some ten years later, when he painted his first 'Improvisations'  that he began to work exclusively in his studio. ..I had always been mainly a plain-air painter.. .At first I experienced great difficulty with my brushwork – I mean with that the French call 'la touche de pinceau'. So Kandinsky taught me how to achieve the effects that I wanted with a palette knife. In the view from my window in Sèvres, that I painted in 1906, when we were together in France, you can see how well he taught me. Later of course, here in Murnau, I learned to handle brushes, too, but I managed this by following Kandinsky's example, first with a palette knife, than with brushes. My main difficulty was that I could not paint fast enough. . .When I begin to paint, it's like leaping suddenly into deep waters, and I never know beforehand whether I will be able to swim. Well, it was Kandinsky who taught me the technique of 'swimming'. I mean that he taught me to work fast enough, and with enough self-assurance, to be able to achieve this kind of rapid and spontaneous recording of moments of life. In 1908.. .I worked more and more on my own. When Kandinsky became increasingly interested in abstract art, I also tried my hand, of course, at a few improvisations of the same general nature as his. But I believe I had developed a figurative style of my own, or at least one that suited my temperament. ..we parted in 1914, when Kandinsky, being an enemy alien [because of his Russian nationality and living in Germany], had to flee from Germany to Switzerland, as did Jawlensky and Marianne von Werefkin too [to neutral Switzerland]. ..Ever since we parted in 1914, I have worked mainly by myself. After the First World War, here in Munich, we found that our Blue Rider group had broken up. 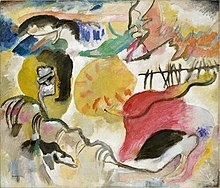 Franz Marc and Macke had both been killed [in World War 1.] Kandinsky, Jawlensky and Marianne were no longer here [in or around Munich].. Concerning the Spiritual in Art. Retrieved on 2012-05-03.